The play area itself is large with a padded floor, the typical Simon Mall playground. There is a plane, a cow, a baseball, a car and a mirror all padded for climbing and playing. It is certainly worth grabbing a cup of coffee from the crepe place and hanging here during the heat of the day while the kids exhaust themselves. 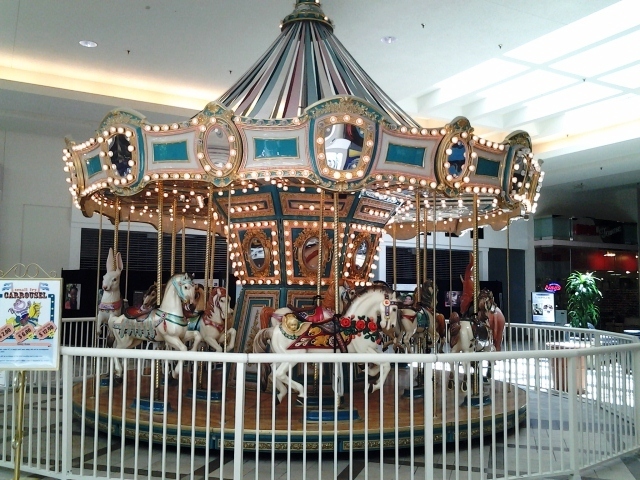 My daughters favorite is the carrousel. It is cute if on the small side, but the horses are full sized and kids love it and won’t complain. Your wallet won’t complain either for $2.00 a ride. The trackless train is big hit. It takes a longish ride starting from the food court, around the carrousel and back to the food court. The Tornado Bumper Cars looked pretty cool, but this one is probably for slightly older children. 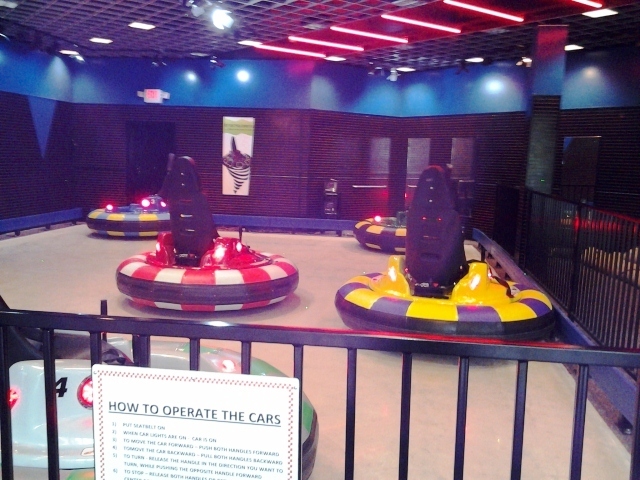 These bumper cars do not move like normal ones, they can spin on a time and move in any direction. They looked fun and I really wanted to try them, but I am not sure my Little could control them quite yet. There is a height requirement for this $4.00 ride. There are a few coin operated rides in the food court which are always good for a climb around. My pictures are not great of these so I will leave it to your imagination. There are about 4 of them and they range from $1 to $2 to ride. If you haven’t already, don’t let your child know they move until they figure it our themselves. You can get away without putting quarters in for a while at least! The mall has loads of restaurants, everything from fast food to sit down so there should be options for everyone. It tends to be pretty quiet on weekdays so even better for those with Little’s who just want to crawl. All in all, a good way to wear out the Little’s without wearing you and your wallet out! 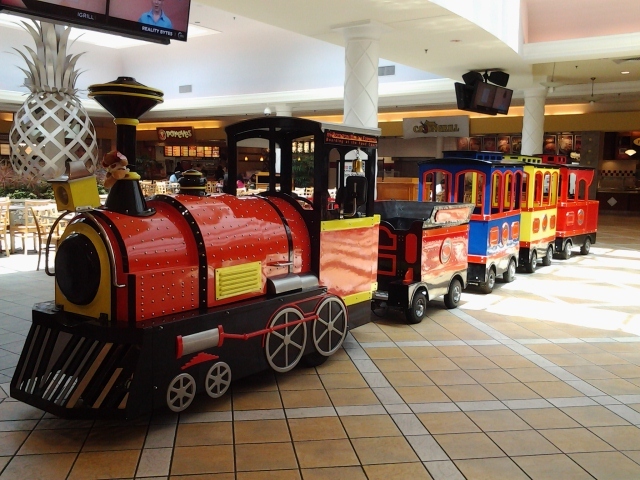 This entry was posted in Events and Reviews, Florida, Summer Picks, Uncategorized and tagged Boynton Beach, Carousel, Indoor Play Area, Mall Playground, South Florida, Train Ride by Cynthia Buckley. Bookmark the permalink.